Well, not from scratch, but there was a setback tonight. Though you wouldn’t know it from the blog the last two weeks, there has been some knitting around these parts. 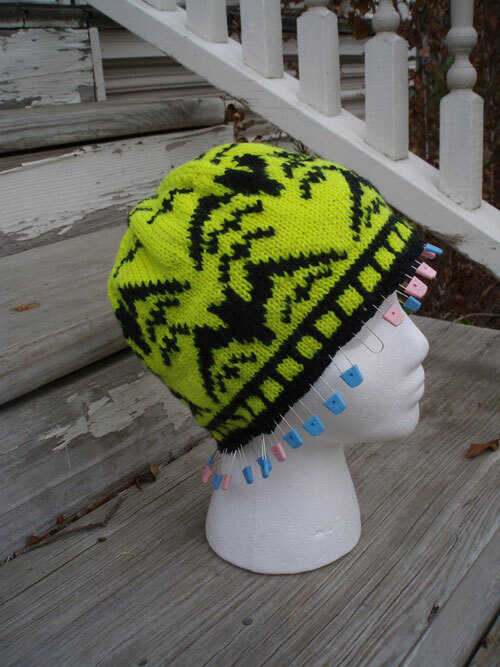 And among that knitting has been Monica Gausen’s BatHat. My goal was to finish by Halloween, and I actually did finish knitting the hat by Halloween. 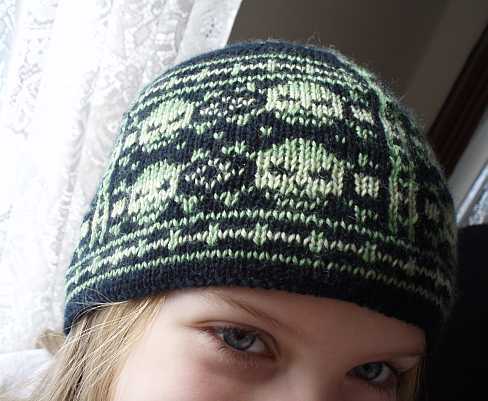 Now, I modified the hat to knit it in a different yarn at a gauge of 24 stitches per 4 inches rather than 26 stitches per 4 inches, calculating that this would make an adult-sized hat. Ms. Gothlet has a head that’s small adult-sized now at 21.5 inches around (the size of my mannequin head, actually), but is about to enter a major growth spurt, is born into a big-headed family, and she outgrew the last hat I knit her in about 3 months. I wanted this one to last longer! But, as calculated, it came out adult-sized, so it’s a bit big for her right now. I couldn’t block it very much at all, then, only could steam it lightly. And — the Gothlet is like the Princess and the Pea when it comes to wool touching her delicate skin. Not allergic, but sensitive. I reknit the lining of her “Pirates” hat three times, and she still complains that the very top of her forehead gets itchy, where the Panda Cotton lining I finally ended up knitting doesn’t quite (apparently) reach. 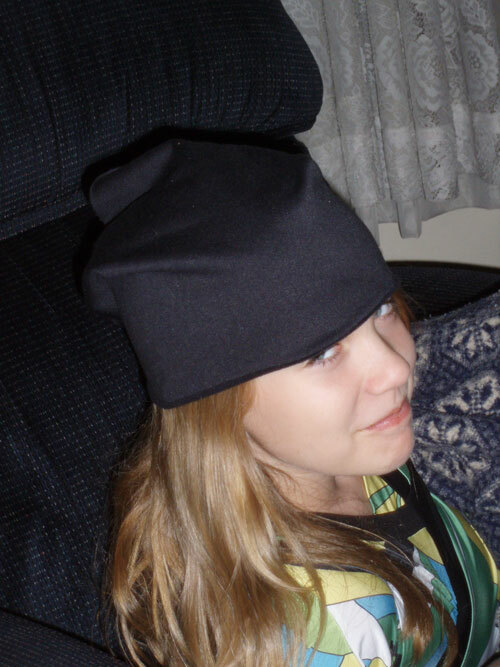 So this hat, I had already decided to fully line in Polar Fleece. Soft, warm, non-itchy. And this would also help the rather-too-big hat fit her now, but with the stretchiness of Polar Fleece, still in the future. I only dared tackle this solution because I had seen a comprehensive, walk-the-“knitter-non-sewer” through ‘lining a knitted hat with Polar Fleece‘ tutorial at TECHknitting™ (an amazing resource if you haven’t discovered her knitting how-to blog already). I hate sewing and I have done very little since junior high school other than mending. But the tutorial was comprehensive. The employee at the Sow’s Ear who had rung up my purchases including the Dalegarn Neon Falk yarn that I bought for this project at the Gothlet’s request, recommended ‘athletic fleece’ specifically, and I’m glad she did; I had no idea, but it’s great stuff; thin and very stretchy. I think otherwise this hat would be suitable only for January weather even here in Wisconsin, given stranded colorwork (thus two layers of wool) and then the usual thick fleece also. But I found some thin black athletic fleece on sale, even. Well, tonight I finally had the Gothlet head, the fleece, me and the time — all together in the same place. pinned again and hand-sewed some more, then painstakingly sewed in the lining, tiny overcast stitch by overcast stitch, black on black, while listening to (I certainly didn’t have eyes free to look) “The Princess Diaries” which the girls were watching on TV. I realized I’d sewn the lining in, inside out. 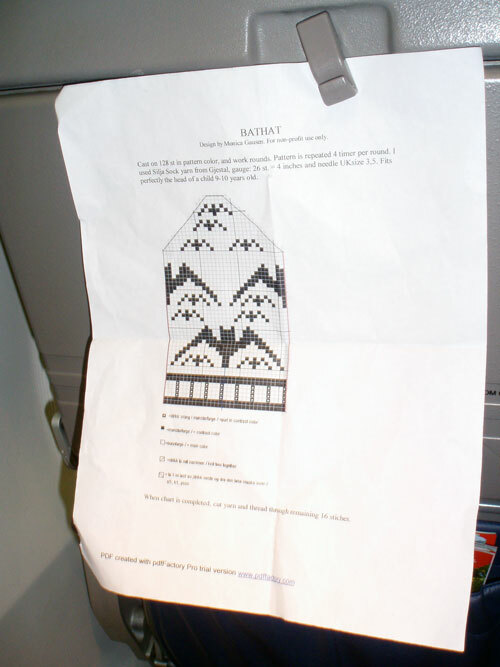 This entry was posted in Knitting, NaBloPoMo and tagged BatHat. Bookmark the permalink. OMG. That is SO totally something I would do. Have we discussed how much I hate sewing? And how much I love the Sow’s Ear? Once again the Demons of Dumbness strike. I attached a sleeve upside down to a child’s sweater once. You will be a verrah, verrah good hand-stitcher by the time the BatHat is done. It’s quite gorgeous, you know.